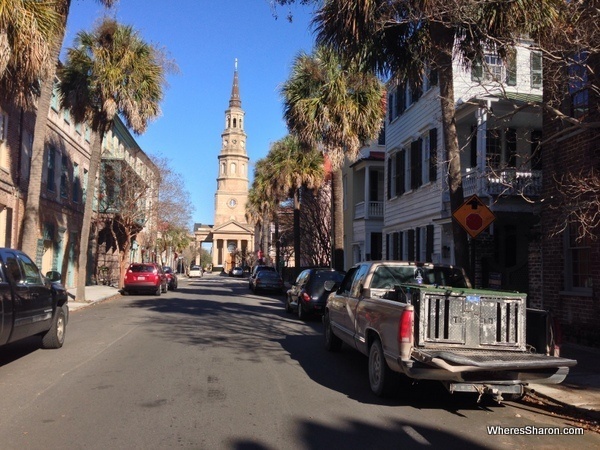 After leaving Columbia, we were excited to arrive in the fabulous city of Charleston, one of the places we were looking forward to visiting the most on our Road Trip USA Deep South Tour. We had high expectations of this city and it didn’t disappoint. Check out our list of things to do in Charleston, South Carolina. 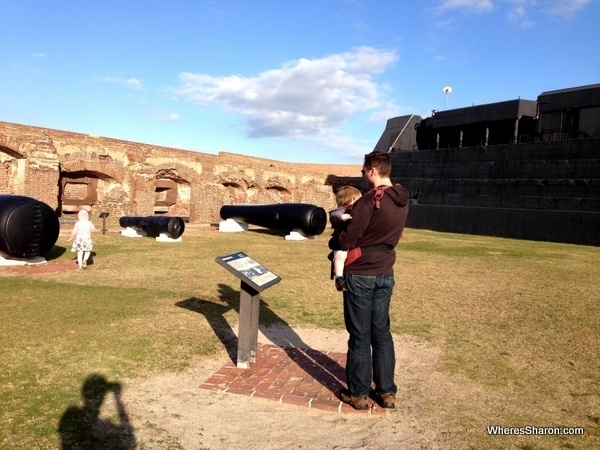 We started our Charleston stay with a visit to Fort Sumter. Fort Sumter is the site of the first shots of the American Civil War. 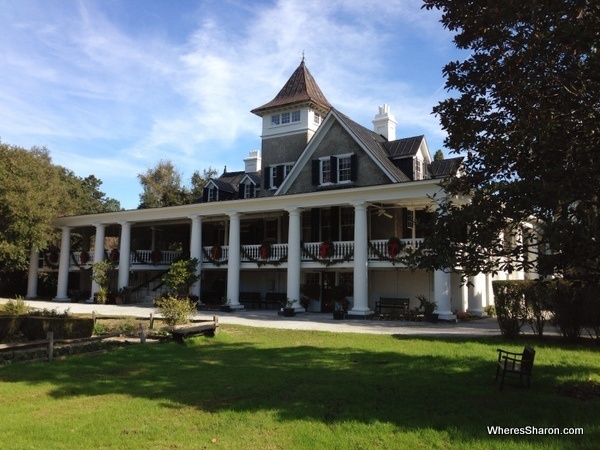 It is situated on an island a half hour ferry ride from Charleston. There are tours multiple times a day which include a guide, entry to the site and the ferry ride. On the island and on the boat ride over, we were told lots of information about the civil war and its beginnings. We also learned about the battles that took place here. We didn’t do the included island tour, but there are many signs and an informative museum as well. It worked out ok with kids, but we were all cold and bored by the end and didn’t need an hour on the island. 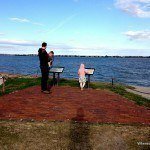 It is a very interesting and well set out site though and it should definitely be on your list of things to do in Charleston, especially if you don’t have young kids. It is great value as well. You can read more our time in Fort Sumter. The next day was very busy as we set out to check out Charleston’s Historic District and the USS Yorktown. I was looking forward to Charleston’s Historic District and not only was I not disappointed, but I fell in love. If you have been following this blog throughout this road trip, it may seem like I fall in love a lot, but Charleston really is impressive. The historic district is just gorgeous. There are grand old homes, churches everywhere, some run down atmospheric cemeteries and city streets which are just lovely to walk. What is not to love? We put S in the stroller and Z in the carrier and just explored. We loved every moment of it. We strolled along the Gateway Walk visiting old churches and centuries old cemeteries. We walked past many museums, although unfortunately we did not get the chance to go in them as we couldn’t see that working with the kids. 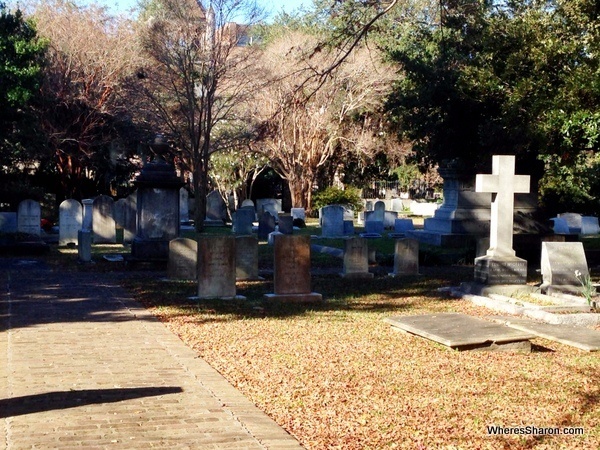 There are many things to do in Charleston just in the Historic District. We had house envy about a million times over, especially when we walked along “Rainbow Row”, one of the most photographed areas of town which is saying a lot. Gigantic, colourful mansions lined the street across from the waterfront. It is quite a sight. We visited Marion Square, a 10 acre park in the historic district full of various monuments and a gigantic Christmas tree. There were big wide footpaths everywhere and some good looking strips of shops (something we have found lacking in most downtown areas on this road trip). It was so nice to just walk around again, as our favourite thing to do in a new place is to explore on foot. Most of the places we have passed through in the last few weeks have just not had areas where we would want to do that. 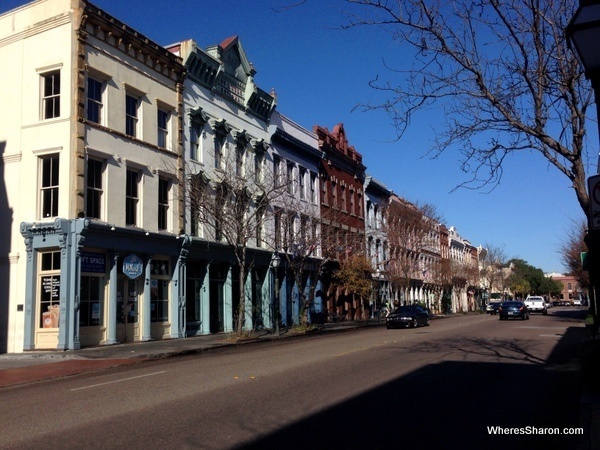 We loved the Historic District, and it is a definite must on any list of things to do in Charleston. This heading probably seems random, but it is the name of the place where we stopped for lunch. J had done a fair bit of research on the best lunch option and this is what he came up with. It was fabulous. It was a Southern Style BBQ, and we had the best rolls ever. To call them rolls actually seems to be putting them down, but I don’t know what else to call them except maybe “the holy city” which is what they called them. It was sooo good with a whole bunch of homemade sauces from sweet potato pie sauce to beer ones to caramel ones. This probably sounds weird, but they were oh so good. 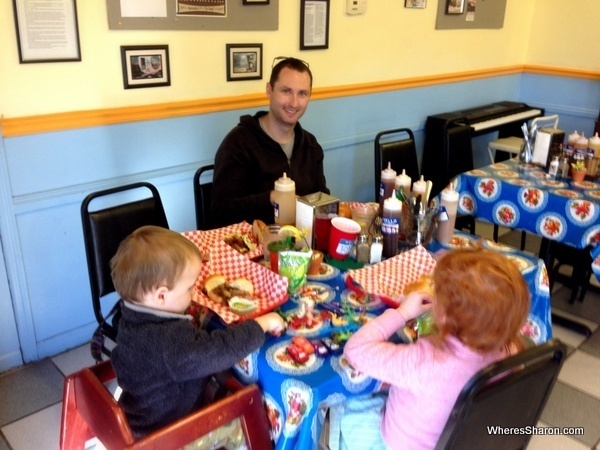 It was not only delicious but cheap and incredibly kid friendly. They kept coming over to help us and even brought our some cars, mermaids, crayons and colouring in books for the kids. S was also given a reindeer headband. Every aspect was just awesome. The USS Yorktown is an aircraft carrier that tourists can explore at Patriots Point in Charleston. It is just fabulous. Once we boarded the ship, there are 6 self-guided tours. Each tour involves visiting a certain area of the ship. There are many signs and information boards. It is fascinating seeing how people live and work on board these huge vessels. Simple things like bakeries were on such a large scale. They had recipes on display which showed the ingredients to make cookies for everyone on board – 500 eggs! We also explored an engine room and the bridge. We all loved sitting in the captain’s chair. We even sat in a dentist’s chair and explored a reasonable sized dentistry area. It is not something I realised would be on an aircraft carrier, but it is easy to understand that they might need it. There are lots of planes both on the top of the ship and on the hanger deck. There are also lots of movies to watch including a one hour documentary. Additionally, there is a medal of honor museum. 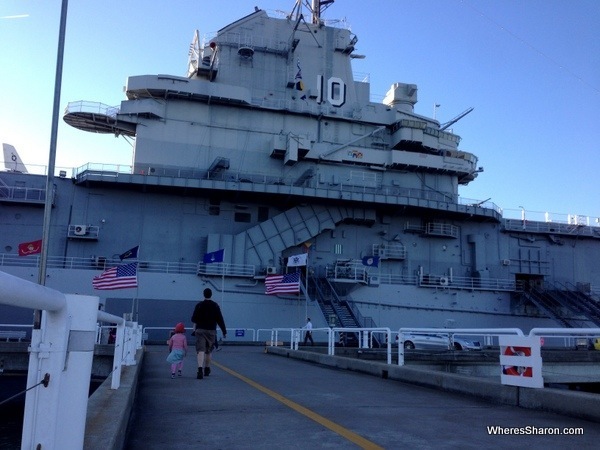 We spent 1.5 hours on the USS Yorktown and it was nowhere near enough time. We rushed the parts that we did do, and we didn’t go everywhere. We didn’t even go on the other ship or submarine. It would be easy to spend the best part of the day here. The ticket allows re-entry on the same day, so going and coming back again later in the day is what I would do if I did it again. We found it fascinating, and I would definitely love to come here again. 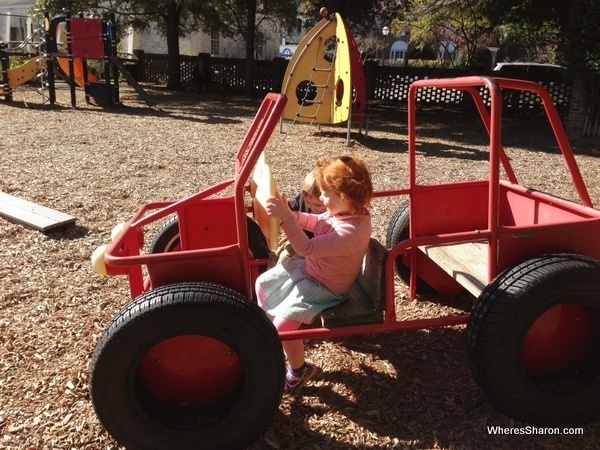 It is tricky with young kids. We had to climb up and down many ladders. 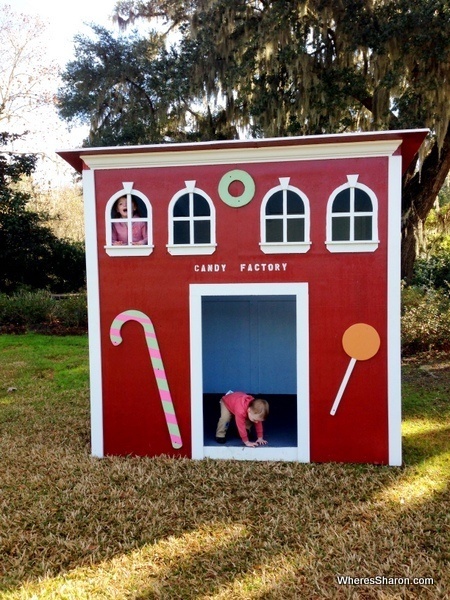 I would not recommend it for kids younger than 4 unless you can put them in a carrier or they are very big for their age and very good with ladders and stairs. S was fine, but she is freaky big for 3 and very used to climbing up and down stairs. They are big steps on the ladders, and a couple had the railing quite far apart so she could only just hold onto it. There is no way to avoid climbing around if you want to see most of it, although you could still view some of the main museums and outside parts. It is definitely not somewhere to take a pram. The kids did love it though and were quite happy exploring. I imagine older kids would LOVE it. $18 each for adults and our kids were free. Well and truly worth it! 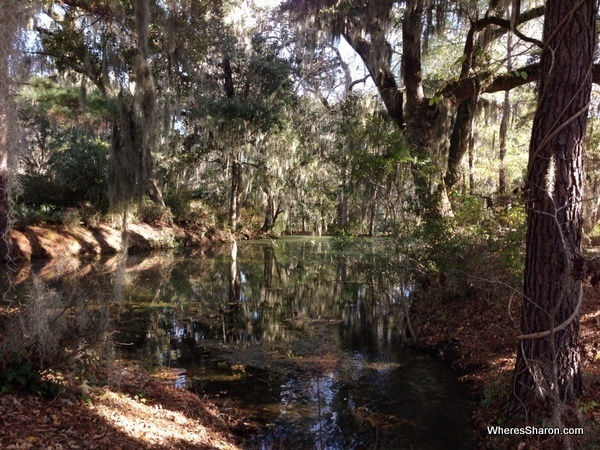 Magnolia Plantation and Gardens was founded in 1676. It consists of a big grand home, the oldest public gardens in America and some other attractions, such as a petting zoo. There is a documentary to watch on entry which explained to us the history of the plantation, although it seemed propaganda like with all the mentions of how great the owners were to slaves. There are quite a few things to do at this attraction with a few different ticket options. We bought basic entry which covered the gardens and the petting zoo. Unfortunately, we didn’t get to go in the house but the tickets get quite pricey and the two hours that we spent exploring the outside was enough for the kids. What we did do worked out very well. The gardens are gorgeous. There are lots of little pathways, ponds and little bridges. I think I expected more so I was a bit disappointed, but it was very nice and quite big. There is also an outdoor maze – we had lots of fun racing each other to the middle. The house looked grand, but I think I expected something bigger. It was great for a different thing to do in Charleston since we had somehow manage to not visit an old plantation until now on our Deep South road trip. I wouldn’t have wanted to pay for a whole family though as I think that is too expensive at $50. It would also be nice if we could have seen the house without paying extra. For a family of 4, that would have added another $32 to the cost of the basic tickets. There were lots of little Christmas houses the kids could play in which was a big hit. A petting zoo seemed a bit random at the plantation, but it was probably the best one I have been in. It was very well set up with lots of animals. One of the deers was probably a bit keen and basically attacked a pram someone else brought in (despite the fact that they were told prams weren’t allowed). All in all, we were happy we came here and we recommend it to others. $15 per adult for the basic ticket, the full ticket is $47. Kids under 6 are free. 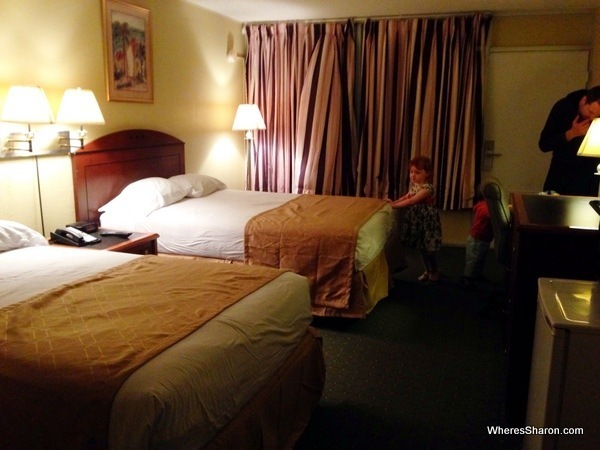 We stayed at the North Charleston Inn. We had a great 2 double bed room with fridge and microwave, coffee making facilities, and a good heater. The room was a good size with a new bathroom. There was included wifi and breakfast. Our room was right by a pool, but it was too cold for that. It was a very quiet, nice place to stay, but it is near the airport so occasionally we would hear a loud plane but this was no issue. North Charleston Inn $62.50 a night with breakfast, fridge and microwave. Click here to see the latest prices. 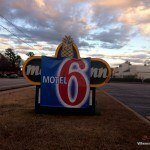 Days Inn Historic District – This is a good budget option if you want accommodation in the Historic District of Charleston. Click here for the latest prices. Hampton Inn – Charleston Historic District – Another great option in the Historic District if you want something a bit nicer. Find the latest prices here. We recommend using HotelsCombined to find the best deals as it will show you the best prices across a variety of hotel booking websites. Over the two days we spent in Charleston, we went about $65 in total over out $272 budget. This is because we visited more paid attractions than usual, and we did a big supermarket shop for nappies and toiletries. I think this was very good value as we did go to some awesome attractions. Charleston is very good value. They were very happy in Charleston and they seemed to love it all except for getting bored at Fort Sumter. 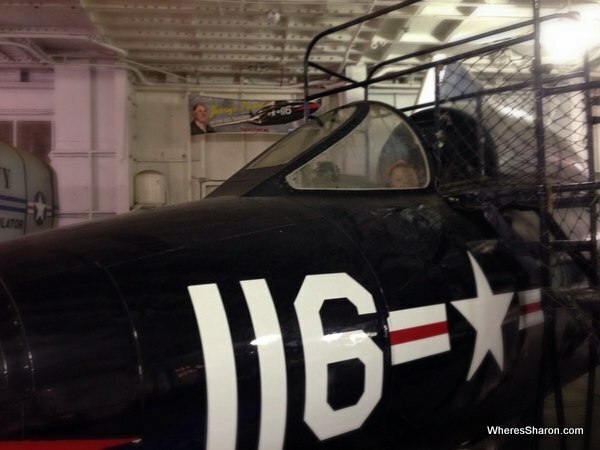 They especially loved exploring the USS Yorktown, sitting in the fighter jet and the petting zoo and Christmas houses at Magnolia Plantation. They are both enjoying the road trip and are not having any problems. S had a mega meltdown on our last morning, but that happens occasionally. Unfortunately, there seems to be no way to avoid that whether we are at home or away. There are so many great things to do in Charleston that it is a shame that we did not have more time. It is a beautiful city. 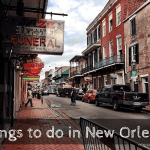 I actually liked the Historic District more than the French Quarter in New Orleans. It felt more real. There was nothing we didn’t like and a good variety of attractions. The USS Yorktown is one of the most interesting places we have been. It should be a must visit destination on any road trip in the US. 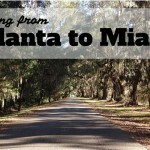 We were sad to leave Charleston, but excited about the stops ahead on our way back to Miami. Next stop? Historic St Augustine, Florida with a stop in Savannah, Georgia on the way! 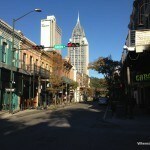 You can also read our overall thoughts about our Deep South USA road trip. What are your favourite things to do in Charleston? Disclaimer: This post contains affiliate links. If you make a booking after clicking on this link, then we may receive a small commission at no extra cost to you. Charleston sounds great! I’ll be visiting the city on a cross country road trip later this summer, so thanks for the recommendations! Lucky you. I am so hanging out for another US road trip! Oh how lovely! I want to go to Charleston sooooo bad. When I book my trip I will be sure to follow your tips! Thanks. You should definitely try to make it to Charleston. Such a fabulous place! My family took a vacation there when I was very young. I hardly remember anything except perhaps the overwhelming impression that it is a truly beautiful city. Glad you got to visit it! I only live about a 5 hours drive away from Charleston, but sadly I’ve never been. It looks beautiful though and your post has made me want to book a trip there. Wanted you to know that your photo is not of Rainbow Row. 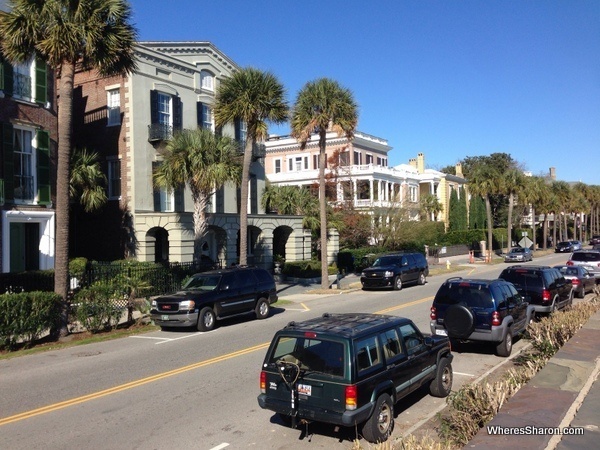 RR is a group of colorful row homes on East Bay St, just pass Board St as you head towards the Battery…which is where your photo was taken. As a local, I am so glad you enjoyed our beautiful city of Charleston!